Lawyers’ Professional Indemnity Company (LAWPRO) was created to insure lawyers against legal malpractice claims. Most (though not all) claims are brought by a lawyer’s own client and include an allegation that the lawyer made a mistake or did not meet the standard of care expected of him or her when delivering legal services. Students in the midst of law school, with its mountain of reading on cases and substantive law, might be surprised to learn that “errors of law” are not the biggest pitfall to watch out for in the world of private practice. In fact, in the last ten years, only about 12 per cent of LawPRO malpractice claims were caused by lawyers getting the law wrong (except in very complex areas like family or tax law). 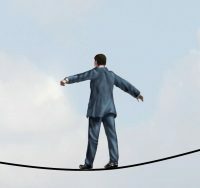 So, if knowing the law isn’t the problem, what is the danger that new lawyers should be on the lookout for? In a nutshell, you could call it “human error”: breakdowns in communication, poor calendaring and procrastination, and not digging deeply enough into a client’s matter. These types of errors make up almost 70 per cent of the claims LawPRO sees. However, there is much that can be done at every stage of the matter to prevent these types of claims. Right from the outset, a well-drafted retainer letter can set the client’s expectations of how the matter will proceed and what the lawyer will (and won’t) do for them. As the matter progresses, it is important to document conversations with the client, your advice, and the course of action the client wishes to pursue. This documentation can be a lifesaver in the event of a malpractice claim. Clients may later say they asked the lawyer to do X and it wasn’t done; or the lawyer may have done Y and the client claims he didn’t authorize this course of action. If there is no documentation of lawyer/client conversations, the claim then turns on credibility, and LawPRO’s experience has been that courts are more likely to believe the client’s more specific recollections over the lawyer’s typically vague or non-existent memory. The best way to avoid these claims is to simply slow down. Take the time to read between the lines so you can identify all appropriate issues and concerns. ask yourself: what does the client really want? Does everything add up? are there any issues or concerns that should be highlighted for the client? If something doesn’t add up, dig deeper. One way to ensure that the right questions are asked on a matter is to make use of the practicePRO programs articles and checklists. At practicepro.ca/checklists you’ll find checklists for domestic contract matters, commercial transactions, and independent legal advice, as well as claims prevention articles from LAWPRO Magazine. There are a number of things you can do to avoid missing a crucial deadline. Familiarize yourself with the Limitations Act, 2002 by using practicePRO’s limitations resources at practicepro.ca/limitations. Use practice management software with tickler systems to alert you to approaching deadlines. Be aware of the danger of the registrar dismissing an action for delay under Rule 48 of the Rules of Civil Procedure (see our Rule 48 Transition Toolkit at practicepro.ca/rule48 for help). Finally, building in a one- or two-day cushion on deadlines and reminders can help prevent this type of error when there are unexpected problems that stop you from meeting a deadline for a filing (e.g. ice storm; or taxi in an accident on the way to courthouse on last day to file). These are very general descriptions of the common causes of LawPRO claims. 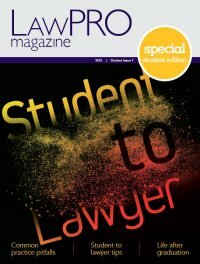 If you want to learn more about malpractice claims in particular areas of law, you’ll find a wealth of articles in LAWPRO Magazine’s archives. There are detailed examinations of claims causes in several areas of law, as well as articles featuring advice from LawPRO’s own claims counsel on the common mistakes they see lawyers making and how to avoid them.